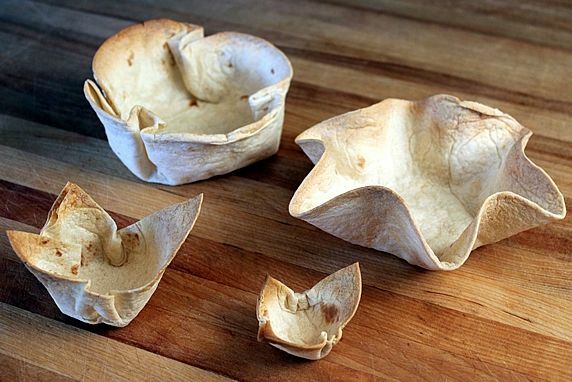 These are the perfect size for making appetizer tortilla cups. "101 Things To Do With A Tortilla" A fun collection of recipes with traditional and creative uses for tortillas. 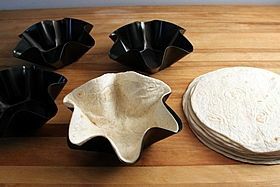 1. tortilla shell maker molds (available at Amazon.com) -- press tortillas inside forms, bake for 14-16 minutes or until evenly browned. 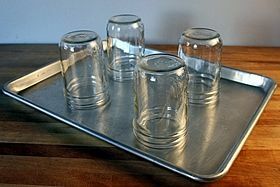 4. inverted canning jars -- coat outside of jars with cooking spray; press tortillas around outside of jar; bake for 14-16 minutes or until evenly browned. 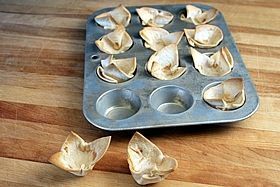 5. regular muffin tins -- cut 10" tortillas into quarters. 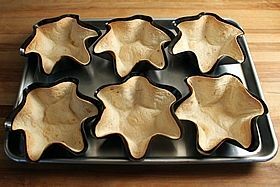 Press tortilla pieces inside muffin tins; bake for 12-15 minutes or until evenly browned. 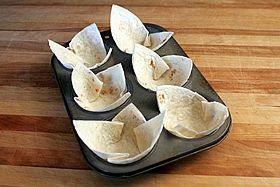 6. mini muffin tins (appetizer size) -- cut 6" tortillas into quarters. 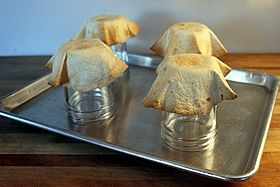 Press tortilla pieces inside muffin tins; bake for 12-15 minutes or until evenly browned. 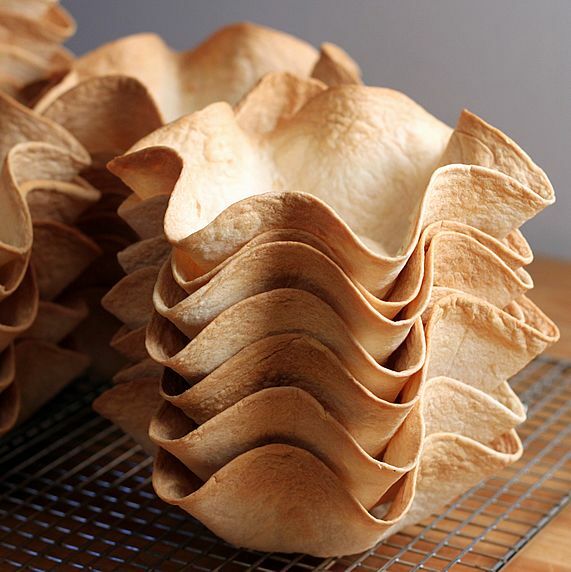 Let tortilla bowls & cups cool in/on pan, bowl, or jar for 2-3 minutes before transferring to wire cooling rack. May be made a day ahead and stored in airtight plastic container or bag. 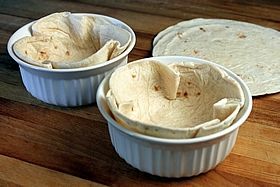 To bake multiple tortillas bowls at one time, place multiple tortilla maker molds, bowls, or jars on large baking sheet in oven. I recently served a tortilla bowl taco bar for some big dinner parties at our house. 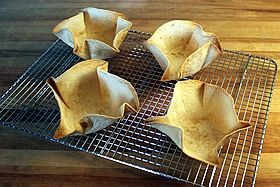 The tortilla bowls can be made in a variety of ways and are a fun to fill with taco ingredients or salad. Mini size tortilla cups are perfect for appetizer portions. You may have had salad served in tortilla bowls in restaurants. If so, chances are the bowls were deep fried. All that hassle and mess of frying and all those fatty calories aren't necessary. 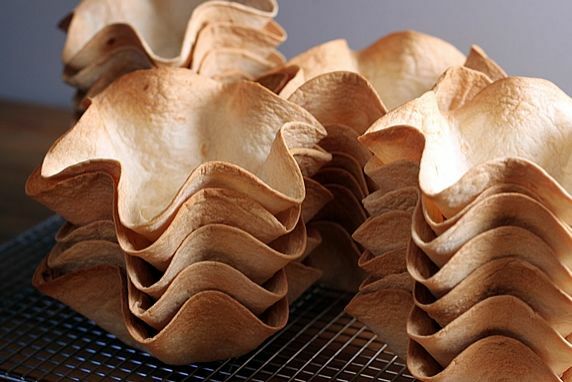 The method I describe involves baking the bowls with no added fat at all. I've seen other recipes that called for coating the tortillas with oil or butter before baking. I tried that, but actually prefer them without any oil at all. They're crisp and delicious just the way they are. After making well over 100 of these bowls in the last month, I learned a few things. You won't believe how easy this is. Here's how. 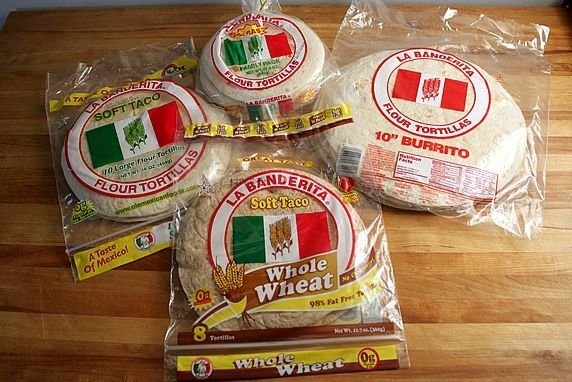 Use your choice of flour tortillas. I experimented with a variety of sizes. White and whole wheat both worked well. The tortillas I used were sold at room temperature. They were already soft and didn't require any heating to make them pliable. If you're using refrigerated tortillas, wrap them in a slightly dampened dish towel and zap them in the microwave for 20-30 seconds, just until they are soft. Don't overheat them or they will get hard and brittle. The tortillas below were 6", 8", and 10". 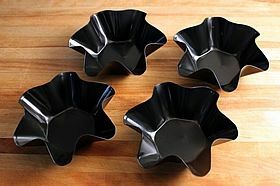 If you'll be making these often or making a large number for a party, I highly recommend these molds. I got mine for a reasonable price on Amazon. 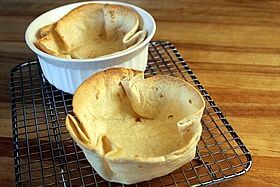 They are non-stick, easy to use, can be used with any size of tortilla, don't require any added oil, butter, or spray, and result in evenly browned and crisped tortilla shells. For my taco bar, I used 8" tortillas. I could fit 6 tortilla shells on my 13x18" baking sheet. Baked them at 375 degrees for 15 minutes and they were perfect--evenly browned and crispy. 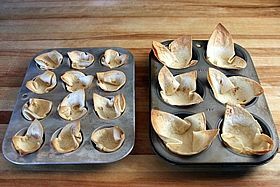 Let them cool in the pan for a couple of minutes, move them to a cooling rack, reload the forms and bake the next batch. 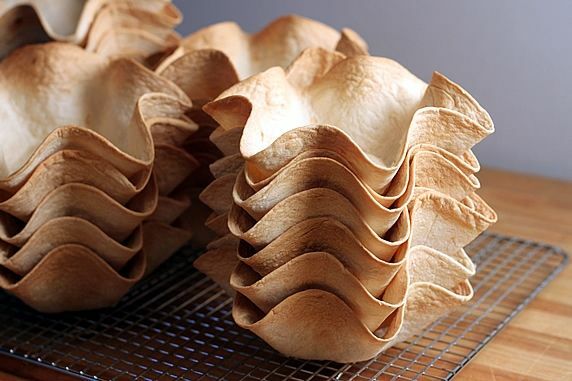 In a little over an hour, I could bake 24 tortilla bowls. 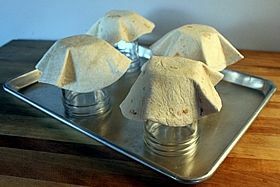 A big benefit of using these shell molds is that the finished tortilla bowls stack and nest compactly. They can be made ahead and stored in a large airtight Ziploc bag or plastic container. 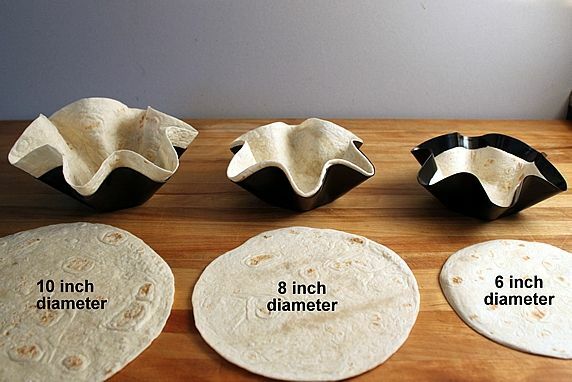 These same tortilla shell molds can accommodate any size of tortilla, as you can see pictured below. 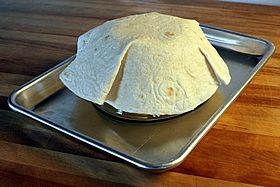 Method #2: Form tortillas inside an oven-proof bowl. You can also use any oven-proof bowl you have. 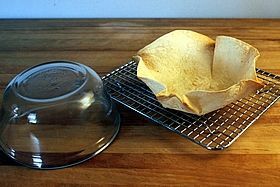 Coat the bowl with cooking spray, gently press the tortilla inside the bowl, and bake. These didn't get as evenly browned as the ones I cooked in the tortilla molds. The edges of the tortilla bowl browned before the bottom. The bottom of the finished bowl wasn't crisp, but it did harden as the bowl cooled. It never got as crispy as the top, but it was still usable. 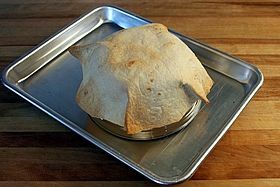 Method #3: Form tortillas outside an oven-proof bowl. 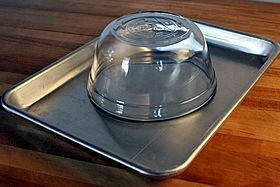 Coat the inverted bowl with cooking spray and place it on a baking sheet. Gently press the tortilla around the outside and bake. The tortilla browned evenly on the outside and was nice and crispy. The bottom was firm, but not crisp. I first saw this method at Mel's Kitchen Cafe. It was easy and worked well. In these photos, I used wide-mouth pint jars, coated the outside with cooking spray, and inverted them on a 13x18" baking sheet. Then I gently pressed 8" tortillas around the jars. They bake evenly on the outside, but didn't brown on the inside. The only drawback of the jar method is that the finished tortillas aren't as evenly browned on the inside as they are on the outside, and they don't nest and stack, if you're making a lot of them. But, if you're only making a few and don't need to store them, this is a good method to use. 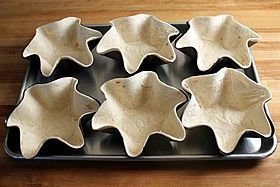 Method #5: Make smaller tortilla cups in muffin tins. This works great for making small portions. 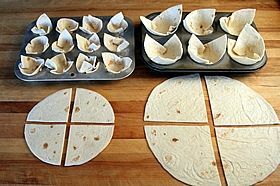 Simply cut a 10" tortilla into quarters, and press each piece into a regular size muffin tin. 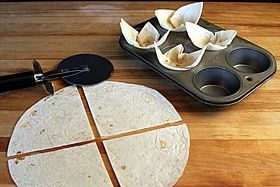 Or, you can quarter a 6" tortilla and press each piece into a mini muffin pan. These bake beautifully and come out evenly browned and crispy. 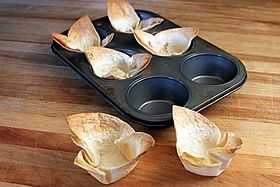 There's no need to oil or spray the muffin tins. 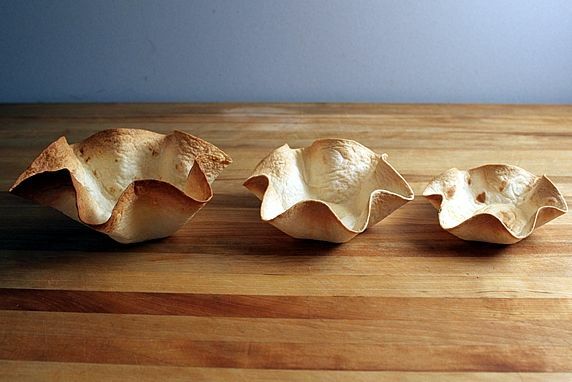 The tortilla cups lift right out. These are great for smaller portions or appetizers. 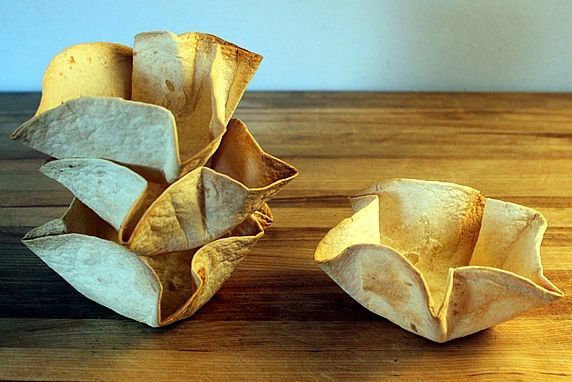 Whatever size you choose, whatever method you use, there are so many fun and tasty ways to use these tortilla bowls and cups. I'll share serving ideas in upcoming posts. 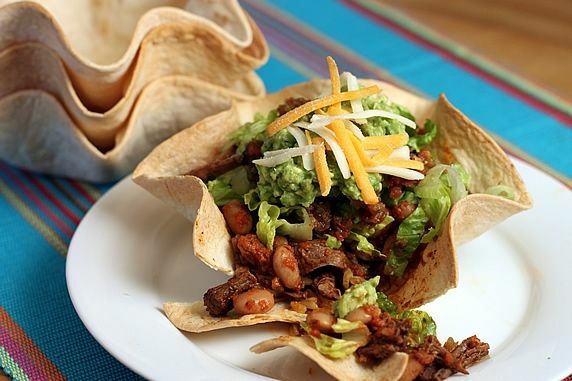 My favorite way to use tortilla bowls is to fill them with all of the tasty fixins' of a taco. It's a fun family meal or party buffet.